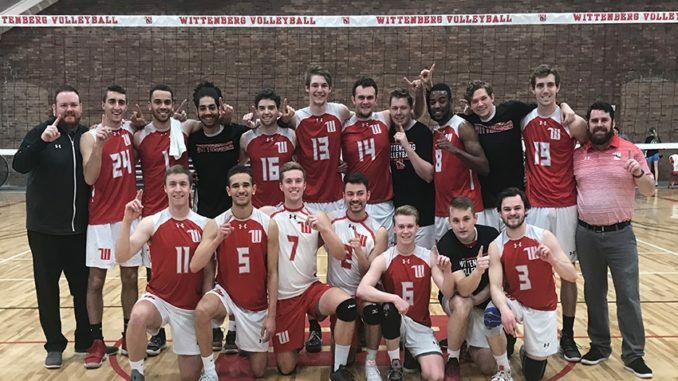 The Men’s Volleyball team throws up one’s to celebrate the victory. Photo courtsey of wittenbergtigers.com. On Thursday April 4, the men’s volleyball team took on the Randolph-Macon College’s Yellow Jackets. The Tigers beat out the Yellow Jackets in three out of four sets and came out victorious, 3-1. The first set was a tough battle between the two teams. The Yellow Jackets took an early three-point lead after two brilliant serves and a bad set from the Tigers. A kill from Gabriel Lamar, ’21, put the Tigers on the board. Randolph-Macon and the Tigers went back and forth, grappling for the lead, when the Tigers made three scoring plays and pulled ahead by one point. But the battle went down to the wire, a kill from Deion Woodson, ’21, that came from Ross Russell, ’19, tied the set up 25-25. A serve from Russell lead to an attack error from Randolph-Macon, putting the Tigers ahead by one. Russell had the last serve and another attack error from the Yellow Jackets, ended the match 27-25. The Tigers pulled out ahead quickly in the second set, with four back-to-back points, and they never gave up their lead. Their greatest lead was six-points, and their smallest being the three at the beginning of the set. The Tiger’s twenty-fifth point was sealed after a service ace. It was the third set that the Tigers just couldn’t conquer. It started as a simple back and forth between the Tigers and the Yellow Jackets, but Randolph-Macon cinched a three-point lead after an attack error. The Yellow Jackets lead the rest of the set with the Tigers nipping at their heels. A kill from Lamar put the Tigers at 19 points for the set before the Yellow Jackets’ scored their twenty-fifth point. The fourth set is what put the Tigers over the top and allowed them to capture the 3-1 victory over the Yellow-Jackets. While Randolph-Macon scored the first point, the Tigers turned around and tied it up quickly. The Yellow-Jackets had three consecutive errors that put the Tigers ahead 12-4. The Yellow-Jackets continued to make mistakes left and right, so the Tigers took full advantage of it. The Tigers were up by seven when the Yellow-Jackets were able to bridge the gap again, they had several service aces and kills but the Tigers weren’t going to just roll over and let that happen. After pushing back with a kill from Martis Roze, ’19, the Tigers clenched their victory over the Yellow-Jackets. Over the weekend of April 6 and 7, the Tigers hosted Medaille College, D’Youville College and Penn State University-Altoona. Saturday was senior day for the Tigers where they honored their ten seniors; Isiah Brock, Troy Boucher, Ross Russell, Nathan Matthews, Ashton Sellers, Roze, Charles Atkinson, Blake Sobieralski, Justin Luby and Ryan Roark. On Sunday, the Tigers went up against PSU-Altoona and were victorious, 3-1. This win was the Tigers’ first Allegheny Mountain Collegiate Conference regular-season title. This was their final regular-season match of the year and will be heading into the volleyball tournament in the coming weeks.